Acquired: In Person, San Antonio Riders v Birmingham Fire 1992. After being touted by the Vanderbilt football program in 1988 as a Heisman Trophy candidate, Eric Jones was signed in 1989 the British Columbia Lions of the CFL. June Jones and the Detroit Lions soon came a calling after a season ending injury to quarterback Rodney Peete where he was on the roster for the remainder of the season. 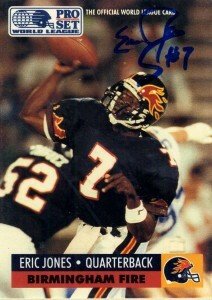 By 1991, Eric was picked up by the Birmingham Fire of the WLAF where he worked his way into the starting lineup after inconsistent play and injury took its tool on starting quarterback Brent Pease. Jones would also wear the helmet cam during the 1991 post season when the team faced the Dragons in the playoffs. In 1992 Eric was backup to Mike Norseth and played sparingly that season before the league disbanded. I’d get his autograph after the night game ended between the Riders and Fire. He was really gracious, and excited to sign my card. Eric after football has worked his way into the medical field and is now involved with the Boston Scientific Corporation where he sells defibrillators and pacemakers. He resides in Macon, Ga with his wife and two children.